The innovation trigger stage - This sounds neat, so lets do it! 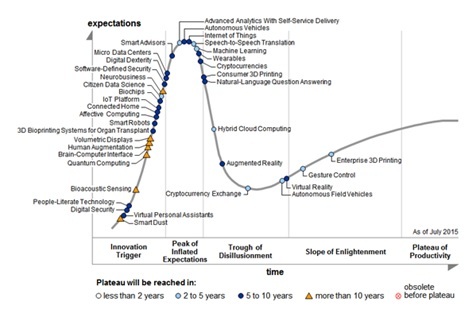 Inflated expectation stage - This technology is going to change the world single handed. Disillusionment stage - This technology was just a wet squib. Nothing will come of it. Enlightenment stage - The technology's real world applications start to be appreciated. Productivity stage - Widespread use starts to impact society and / or industry. Today we are looking at metal 3D printing technology, and considering how it will impact the welding industry. I believe that metal 3D printing (or additive manufacturing, to use a more descriptive term) is in the slope of enlightenment, so it is only years away from making real impacts. In fact, in isolated high value added industries such as aerospace and high performance automotive, it is already having quite an impact. While it sounds like metal 3D printing has the potential to replace a lot of welding, the real impact may in fact be a lot different than meets the eye at first glance. Today we try to get to the bottom of what the impact will be on the job market, and particularly on the Welder. As with any new technology, there are a number of different approaches. One of the main approaches is the fusing of metal powders with lasers. Within this basic approach, there are two main variants. In the first variant, a base plate is covered with a thin coating of metal powder. A laser then melts the metal powder in the relevant positions on the flat base. Once this layer has been fused as needed, another thin layer of metal powder is again placed over the first layer. Again this next layer is fused in the required positions. As this process is repeated, the part is built up from the base plate. The unmelted metal powder serves as a support for the part being built up, and is reclaimed at the end. Very intricate parts, including filter elements and meshes, can be manufactured with this variant of the process. The second variant of the powder metallurgy / laser melting process uses a laser that has a metal powder feeder incorporated. The laser is very close to the surface where the part is being built up, and as it moves, metal powder is "blown" onto the surface being melted by the laser. This metal powder is then fused into the part. The accuracy of this second variant is not as high as that of the first, but it does tend to have a slightly higher build speed. Both the variants of the metal powder / laser systems have quite high accuracy, which means that the final machining and finishing is minimal. Almost any metal can be used, although the more reactive the metal (e.g. Titanium or Aluminium) the more difficult the operation. The build "deposition rate" is also rather low. As a general rule, the build platforms for these machines are purged with an inert gas such as Argon, to ensure that there is no oxide formation that can lead to problems. The second approach that is used, is to use a robotically controlled gas metal arc welding (GMAW / MIG) gun to deposit weld metal on a base. This approach tends to be much more robust and "rough and ready" than the metal powder approach. The surface finish is very rough, with low accuracy and definition. Often, these metal 3D printers also incorporate CNC machining. In a way this could be thought of as a CNC milling machine that also incorporates a robotic welding capability. Practically the part is therefore built up by, say, 2mm layers that are then machined as required, as the deposition process continues. This variant has a significantly faster build time, and also allows precision machining of features such as holes or slots, as the build progresses. Intricate details such as those required for meshes are not possible. Due to the significant machining that is still required, we could debate whether this is a true "additive manufacturing" process, but this debate will not change the reality of its usefulness or adoption. Invariably there will be other approaches to metal 3D printing, but these two are the main contenders for mainstream adoption at the moment. The first thought that occurs when thinking of metal 3D printing, is that these components would not need welding, so their use will reduce welding jobs. The current state of the art in metal 3D printing is however of such a nature that large scale products are not practical. In addition, the larger the scale, the more energy will be needed to melt the metal, so the engineering reality is that the net energy required to build a metal component of, say, 1 ton will be significantly higher than just casting a 2 ton component and machining it down. Unless the 3D printing process can be incorporated into the metal production process, the energy economics will mean that traditional metal production and machining processes should be more efficient. In other words, for large scale engineering structures, metal 3D printing will not have a major impact. This will change if a viable process can be developed to "dynamically form" engineering scale metal structures straight from a pot of melted metal. This is just science fiction for the time being. Within this discussion, it appears that the real impact will be within the casting, machining and smaller scale factory based welding market. This is the market currently served by specialty foundries, CNC machining and robotic welding. Within this context there will be an impact, but it is really just one mechanised process competing with another. It will certainly impact the business models of manufacturers, but from a manufacturing jobs perspective, it is just replacing one type of machine operator with another type of machine operator. We previously discussed the notion of decentralized manufacturing in issue 17 of The WelderDestiny Compass. (Click here to see more.) Metal 3D printing will be one of the main technologies that empower this change in business model. This change in business model will certainly have a big impact on logistics companies, as there will be fewer components being shipped over long distances, and fewer components sitting on shelves. The welding industry for safety critical engineering structures is highly regulated. The foundation of this regulation is ensuring the safety of the final structures. Think bridges, steel framed buildings, aircraft, pressure vessels and pipelines. To manage the risks associated with the final product, the material needs to be made to engineering standards, and the manufacturing and welding also needs to be done to engineering standards. When a component is being made in a 3D printing process, then the process that is used for the manufacture of the component will also need to be "certified" in some way. In other words, it will not be as easy as just buying a 3D printer and "going for it". All the necessary production materials and parameters will need to be "qualified" through an approved process. Running a 3D printing operation for safety critical components will become a regulated facility in its own right. The costs of maintaining the necessary systems and "qualifications" for producing metal 3D printed components for safety critical components will not be insignificant, so the economics will tend to force these types of applications to a point where the throughput volumes are high enough to warrant the expense. The metal 3D printing that is based on traditional welding processes will typically need somebody that is versed in welding, to be involved. In these cases, the demand for welding operators could in fact increase due to their adoption. Given the current state of the art in metal 3D printing, I believe that the workload for construction and maintenance welders will be impacted minimally. The demand for welding operators, to operate the equipment, may in fact increase with the greater adoption of metal 3D printing. The bottom line: Hone those welding skills and expose yourself to computer and automation technologies. Both of these skills will be in demand for the foreseeable future. P.S. What is your experience with metal 3D printing? How do you think metal 3D printing will impact the welding industry? Please share your stories, opinions and insights regarding today's topic, directly on the e-zine page on the WelderDestiny website.